The majority of examinations will take place on Mile End campus however external venues are also used. Please read the information on this page carefully and view the below maps to ensure you know where your exam is taking place. 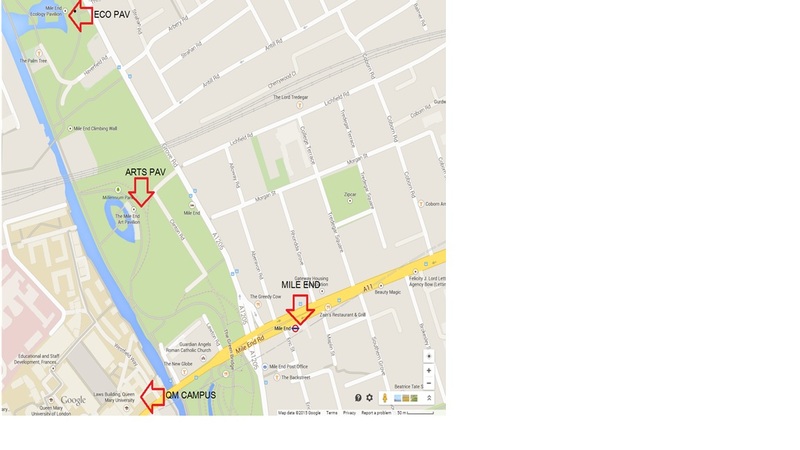 York Hall Leisure Centre is within walking distance of Bethnal Green Underground Station. It can be easily reached from our Mile End campus either by taking the D6 bus or using the Central Line eastbound from Mile End Underground Station. The John Orwell Sports Centre is within walking distance of both Wapping Overground station and Shadwell DLR/Overground station. It can also be reached by taking the 100 or D3 bus routes. The Arts Pavilion (ARTS PAV) and Ecology Pavilion (ECO PAV) are located just a short walk from the Mile End Campus, just off of Grove Road in Mile End Park. Grove Road is also serviced by the D6, 339, 277 and 425 bus routes, all of which leave from Mile End Station Bus Stop G at the top of Grove Road. Whichever way you choose to travel, please ensure that you allow enough time to arrive at least 15 minutes before the start time of your exam. Stratford Town Hall is within walking distance of Stratford Underground Station. It can be easily reached from our Mile End campus by taking the Central Line eastbound from Mile End Underground Station.